Nikolai Andreyevich Rimsky-Korsakov (born March 18 [March 6, O.S. ], 1844, Tikhvin, near Novgorod, Russia – died June 21 [June 8, O.S. ], 1908, Lyubensk), a famous Russian composer, conductor, teacher and one of the greatest masters of orchestration, a member of the group of composers known as The Five (Mighty Handful). Rimsky-Korsakov was a prolific composer, his complete works are published in 50 volumes. Rimsky-Korsakov’s symphonic works which brought him world fame – the symphonic suite Scheherazade, Capriccio Espagnol, the Russian Easter Festival Overture, as well as the operas May Night, the Snow Maiden, Sadko, Christmas Eve, Mlada, The Legend of the Invisible City of Kitezh and the Maiden Fevroniya, The Golden Cockerel and others. He wrote for various instruments, including the world’s first trombone concerto; numerous compositions for chamber ensembles; choral works and songs; and piano pieces. Nikolai Rimsky-Korsakov was born in a small town Tikhvin, near Novgorod, in the family of hereditary noblemen. His father, Andrei Petrovich Rimsky-Korsakov, was a government official of liberal views, and his mother, Sofya Vasilievna, was well educated and could play the piano. She belonged to the family of the landlord Skaryatin, but she was born as a daughter of a peasant serf. His uncle was an admiral in the Russian navy, and his elder brother was a marine officer. Nikolai’s musical abilities appeared at a very early age. He received his first piano lesson at 6 and tried to compose before he was 11. When Nikolai was 12 years old the family moved to St. Petersburg. 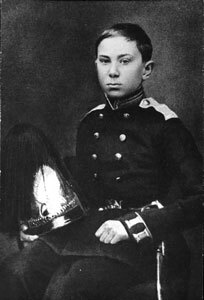 The family tradition required that he go to a military school, in 1856 Rimsky-Korsakov was sent off to the naval Academy of St. Petersburg where he spent the next four years, but he continued to study piano. While there first he took cello lesson and later piano and composition lessons from Théodore Canillé whom he later credited as the inspiration for devoting his life to musical composition. Rimsky-Korsakov also began to go to the opera in St. Petersburg, he discovered the joys of harmony through playing manuscripts of Mikhail Glinka’s Ruslan and Lyudmila and began making his own piano arrangements of excerpts from a range of favourite operas. The year 1861 was significant. 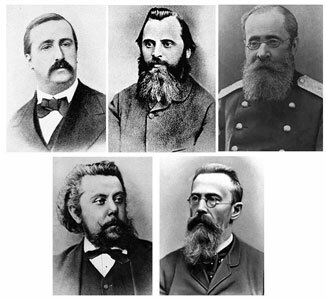 Rimsky-Korsakov was introduced by Théodore Canillé to Balakirev, the leader of a group of young composers, including Alexander Borodin, Modest Mussorgsky and César Cui and the music critic Vladimir Stasov, all of whom became lifelong friends and, with Rimsky-Korsakov, played important roles in the development of Russian music. It was Stasov who called the group Mighty Handful (Moguchaya kuchka) (also known as The Five), he was also its ideologist. Balakirev awoke in Rimsky-Korsakov the ambition to become a composer. In 1862 Rimsky-Korsakov graduated from the naval academy. 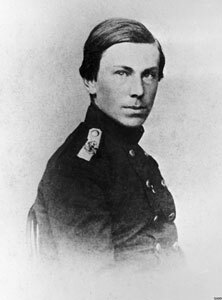 Soon afterward he sailed on the clipper ship Almaz on a long voyage, the vessel anchoring in New York City; Baltimore, Maryland; and Washington, D.C., at the height of the American Civil War. He remained a naval officer for some time, continuing to study composition on his own. In December 1865 Rimsky-Korsakov’s First Symphony had performance in St. Petersburg, with Balakirev conducting. The Overture on Three Russian Themes (Uvertyura na temy tryokh russkikh pesen) was given a successful performance in 1866, while 1867’s Sadko, taken over from Mussorgsky who had abandoned an earlier attempt to set the subject to music, was a short and brilliant exposition of memorable melodies, showing real flair in the orchestration – a talent for which he would later become world famous. His next important work was Fantasy on Serbian Themes (Serbskaya fantaziya) for orchestra, first performed at a concert of Slavonic music conducted again by Balakirev in St. Petersburg, on May 24, 1867. His Second Symphony, subtitled Antar, was completed in 1868. 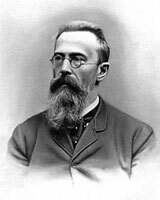 In 1871, when he was still a very young man, self-taught composer, Rimsky-Korsakov was appointed as the professor of orchestration and composition at the St. Petersburg Conservatory. In his autobiographical Chronicle of My Musical Life (Letopis’ moyey muzykal’noy zhizni) (1972, originally published in Russian, posthumously in 1909) he frankly admitted his lack of qualifications for this important position. He was still very young and admitted to not having taught or learnt music academically, except under the guidance of Balakirev and Tchaikovsky’s professional advice. Almost all the important Russian composers of the late 19th century and the early 20th were his students. The composer himself improved his professional skills while teaching the students composition, instrumentation, and orchestration. 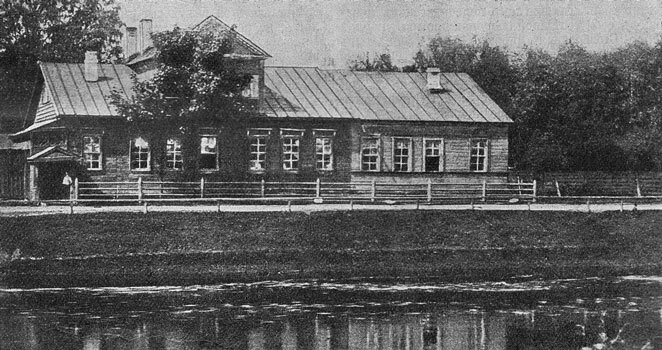 Rimsky-Korsakov’s first opera appeared only in 1872 and it was called the Maid of Pskov (Pskovitianka), based on the drama by Lev Mei. Its premiere took place a year later at the Mariinsky Theatre. The opera engaged his attention intermittently for the next three years, while he also embarked on his second musical career – arranging and orchestrating the works of other composers. The recently deceased Darghomizsky had entrusted the completion of his almost finished opera The Stone Guest (Kamennyy gost’) to Cui and Nikolai Rimsky-Korsakov did the orchestration, thus beginning a career as a collaborator in the works of his deceased colleagues. In 1873 he retired from the Navy but was appointed inspector of navy bands, which inspired him to learn to play band instrument. In 1874 Rimsky-Korsakov started conducting orchestras. Acclaimed as a conductor, he visited Paris in 1889, 1900, and 1907 to conduct concerts of Russian music. In the 1880’s, Rimsky-Korsakov’s symphonic works appeared, and they brought the composer world fame. They include the symphonic suite Scheherazade, composed in 1888 and based on One Thousand and One Nights (also known as The Arabian Nights), Capriccio Espagnol, is the common Western title for a five movement orchestral suite, based on Spanish folk melodies, composed in 1887, the Russian Easter Festival Overture (The Bright Holiday; Svetliy prazdnik), based on themes from the Obikhod, a collection of Russian Orthodox canticles, as well as the operas May Night (Mayskaya noch’), a comic opera in three acts, four scenes, based on Nikolai Gogol’s story May Night, or the Drowned Maiden (Mayskaya noch’, ili Utoplennitsa), it was completed in 1879 and immediately accepted by the Imperial Opera and was premiered with qualified success at St. Petersburg in January 1880, the Snow Maiden (Snegurochka), an opera in four acts with a prologue composed in 1880–1881 based on Alexander Ostrovsky’s play of the same name, Mlada, an opera-ballet in four acts, composed in 1889-1890 based on the libretto by Viktor Krylov. 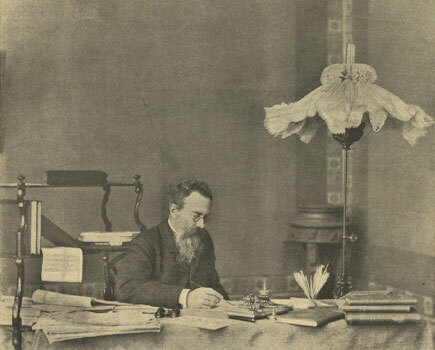 In the early 1890’s Rimsky-Korsakov took a prolonged break from music. 1890 posed severe difficulties on the domestic scene, his mother and two children died. These anxieties and sorrows, no doubt coupled with the effects of twenty-five years of overwork, sent the poor man into a tailspin, which evidenced itself in a total disaffection for music, as well as in alarming physical and mental problems. He read almost compulsively and tried writing theoretical articles, which he found mostly chaotic. The mid-1890’s was a new stage of Rimsky-Korsakov’s creative work. Rimsky-Korsakov had retired, but in the spring of 1894 he began working on Christmas Eve (Noch’ pered Rozhdestvom), an opera in four acts with his music and libretto, composed in 1894-1895, based on a short story, Christmas Eve, by Nikolai Gogol’s Evenings on a Farm Near Dikanka (Vechera na khutore bliz Dikan’ki). The composer next plunged into the legend of Sadko, completing an opera on it in 1896. Sadko is an opera in seven scenes, the libretto was written by Rimsky-Korsakov, with assistance from Vladimir Belsky, Vladimir Stasov, and others. Mozart and Salieri, an opera in one act consisting of two scenes, composed in 1897, based on Alexander Puskhin’s play of the same name. The Tsar’s Bride (Tsarskaya nevesta), composed in 1898, an opera in four acts to the libretto, by Ilia Tyumenev and based on the drama of the same name by Lev Mey. 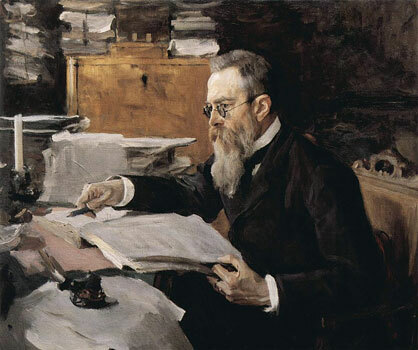 Rimsky-Korsakov in his study, 1908. At the beginning of the 20th century, Rimsky-Korsakov composed the last fairy-tale operas: Kashchey the Immortal (Kashchey Bessmertnyy; 1902), the dramatic prologue Vera Sheloga (starring the great bass Chaliapin), the mystical and extraordinary opera The Legend of the Invisible City of Kitezh and the Maiden Fevroniya (Skazaniye o nevidimom grade Kitezhe i deve Fevronii; 1904), The Golden Cockerel (Zolotoy petushok; 1907). The orchestral interlude for the opera The Tale of Tsar Saltan (Skazka o Tsare Saltane; 1900) gained popularity, it was called Flight of the Bumblebee (Polyot shmelya). Both Nikolai’s professional and private lives were very successful. 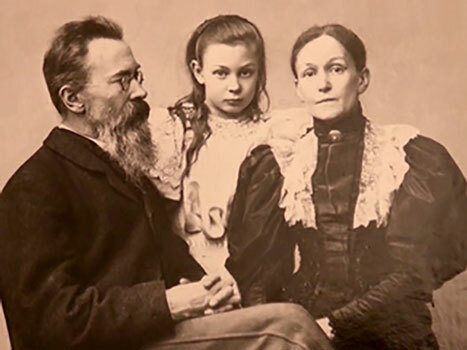 Apart from being a great musician, Rimsky-Korsakov was also a great husband and father. Nadezhda and Nikolai were very happy together and had seven children. The composer died of a heart attack on June 21, 1908, when he found out the news that the opera The Golden Cockerel was banned. At that time, Nikolai Andreyevich was in his Lubensk country estate. The funeral of Rimsky-Korsakov. 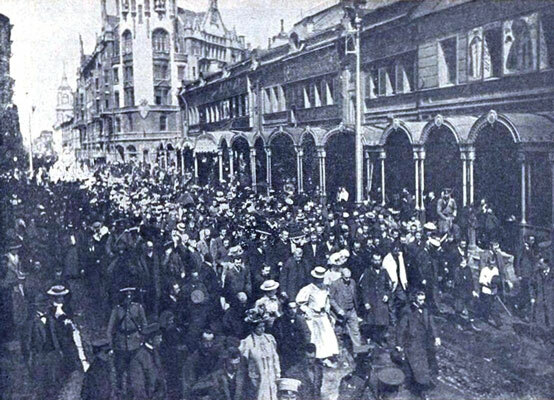 Funeral procession on Voznesensky Avenue.